aci offers pipe jointing compounds that have been specially formulated to enable the easy and speedy fixing of sealing joints on nearly all pipe materials, facilitating the process of inserting a pipe into another especially, those with large diameters. Recommended for all types of pipes, including (PVC pipes, Asbestos pipes, Cement pipes, Pottery pipes, Steel pipes...etc.) Due to excellent lubricating properties, lubricants from aci facilitate the assembly of pipes and avoid, if used correctly, the deformation of gaskets and o-rings used as sealers. Non-toxic, soft, paste like material for lubricating bell joint pipe gaskets. Can be safely used with drinking water pipes and irrigation systems. Does not deteriorate natural or synthetic rubber. Soluble in water, accordingly it won't clog and block pipes. Available in three colors: Clear, White and Brown. Used for joining all types of pipes, in a non-toxic and non-corrosive manner. 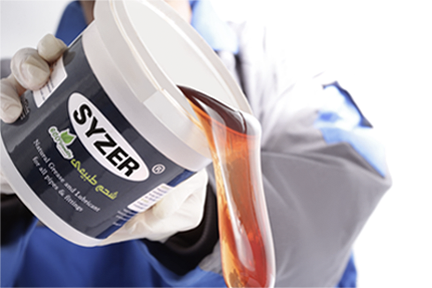 SYZER Grease will not coagulate and will not promote turbidity. Additionally, no taste or odor is transferred to fluids in piping systems. It is a non-toxic, no taste and barely existing odor paste like material used for lubricating and assembling all types of pipelines, providing the desired lubricating properties looked for by customers. 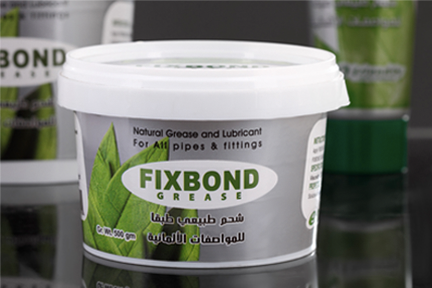 FIXBOND Grease is 100% water soluble, and odor free.